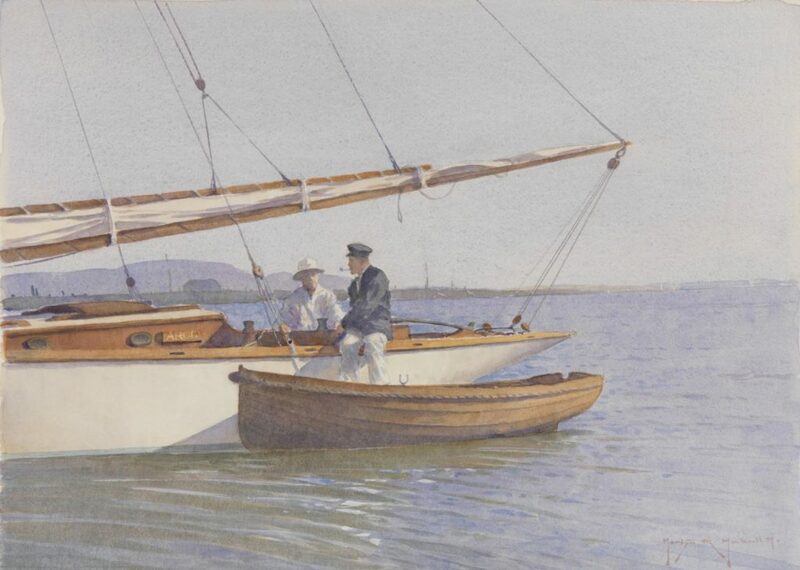 A cor­res­pond­ent famil­i­ar with the first edi­tion of Mess­ing About in Boats wrote to me: a delight­ful book of real sail­ing from a man who comes over as being kind, com­pas­sion­ate and con­sid­er­ate. He bought three cop­ies of our new edi­tion as gifts—an example worthy of emu­la­tion. I reminded him of his brag­ging one day when we were return­ing after put­ting the pilot on board a ship. Bill’s answer was to jump up from the helm, open the door­way in the bul­warks and push the dinghy into the ditch after bend­ing a stout paint­er to a shackle in her fore­foot. 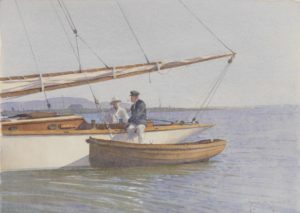 The paint­er was marked at a spot near the dinghy, and at this mark was made fast to the boom at a place where there was a scratch in the wood. He then fixed a tri­an­gu­lar saus­age-shaped fend­er along the door­way out­side the ship and rest­ing against the top­strake of the cutter’s side. We were run­ning at the time with the boom pinned in and the peak hal­liard eased off a little, the usual trim of the main­sail when off the wind, so the peak was set up and the top­ping lift slacked away. Like the book itself, our cover pic­ture is a haven of retreat from the hec­tic dis­trac­tions of today. 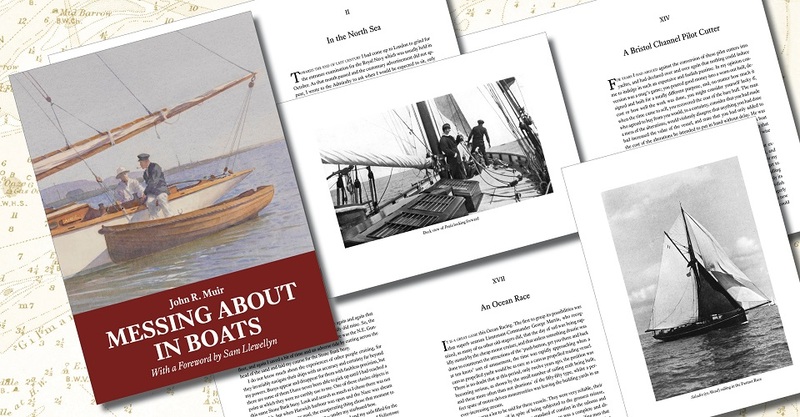 The mar­ine artist Martyn Mack­rill held a very suc­cess­ful show at our favour­ite chand­lery, Arthur Beale, in Lon­don some time ago, where I first came across his work, and of the lovely images he offered as suit­able for this book, his water­col­our ‘Come Aboard’ res­on­ated most strongly with me, as I hope with you. The bio­graph­ic­al details of the author to be found on the cover came via cour­tesy of his alma mater George Watson’s Col­lege in Edin­burgh, which main­tains an archive of the war ser­vice of its former pupils. They now have our new edi­tion of his Mess­ing About in Boats in their lib­rary.